Do you have a mobile device in the form of a smartphone or tablet? If so, there are a lot of smartphone apps that will help you to earn easy cash in your spare time. Many of these smartphone apps are also open to users who live outside the US which makes it very convenient for international residents to earn real cash while they are on the go. The apps that I am going to share with you only require that you do or complete very minimal tasks. Most of the them will take you less than 2 minutes to complete and others may take around 5 minutes. Try to sign up with as many paying smartphone apps as you can so that you can maximize your earnings while you continue to look for and apply to work at home jobs. Here are a few smartphone apps that I recommend for those who live outside the US listed below. This company has a website that you can sign up with as well as a smartphone app for you to download from Google Play or iTunes. They will pay you $0.25 up to $0.50 for each answer that you give. They pay instantly through your PayPal account. You must live in the US, UK, Canada or Australia to sign up. This smartphone app will pay you for your opinions via a video survey. You can cash out when you have $15 in your account via PayPal. They are open to members in the US, UK and Australia. This smartphone app is one of my favorites because you will earn real cash just to spin the wheel. It is fun, easy and takes only 3 minutes of your time each day. It is open to members in the US, UK, Canada and possibly other countries. Please use the code 155066 for 25 bonus spins. You can see my payment proof here. This company has several apps that you can download to win real cash for watching videos, movie trailers, to play trivia games, scratch and win and so much more. It is open to members worldwide and you can access the site online, if you don’t have access to a mobile device. This company is based out of Canada and pays their panel members to answer questions and participate in focus groups via their mobile app or on their official website. They will send you a check in the mail when you reach the $20 threshold. They accept members who are located in the US and Canada. This free smartphone app will pay you to download and try other free apps for points that you can redeem for cash, gift cards or other rewards. You can also earn more when your friends sign up for Feature Points too. It is open worldwide. Get paid to watch short videos and commercials via your mobile phone or online. You will need a Facebook account in order to sign up. There is a waiting list at the moment in order to sign up but you can do so here. Open in the US and several countries for the armed forces. You can use the cash for Amazon gift cards or free cell phone service. Another smartphone app that will give you free cash and gift cards from Amazon, iTunes, Steam Wallet, Google Play and others to try free apps, complete simple tasks, share stuff on social media, watch videos and more. You code bef63c9 when you join for bonus points. Available for download on Google Play or iTunes. Earn free gift cards with the Swagbucks mobile app. 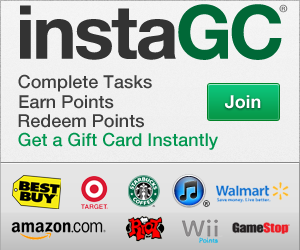 You can earn free gift cards for searching the web, answering fun polls, watching videos and more. You can also download the free Swagbucks TV app and redeem them for free gift cards. Open worldwide. This smartphone app will pay you cash to take photos of you walking the dog, eating various food items and more. Will receive a check in the mail after you have earned $20. Available on Google Play and iTunes.